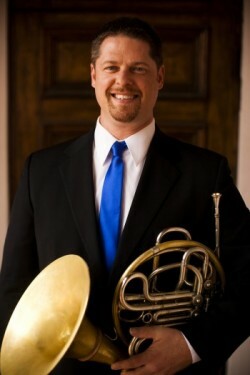 Mike McCoy, a San Diego native, has been the Horn player for the Presidio Brass since its inception in 2006. Presidio Brass is a brass quintet that plays recitals all over the world. For every show they play they offer an educational outreach show and demonstrations for local schools. With a focus on education the Presidio Brass have played for over 10,000 kids across the country as well as Canada and China. He is also a Yamaha and TrumCor sponsored artist through Presidio. In addition to Presidio Brass, he is 4th Horn with the Las Vegas Philharmonic and plays with the Millennia Consort (a brass, organ, and percussion group in San Diego). He has been Co-Principal with San Diego’s Orchestra Nova, and currently performs in the horn sections of, San Diego Symphony, San Diego Opera, and Pacific Symphony. His Horn playing has accompanied the talents of Frank Sinatra Jr., Pink Martini, Liza Minnelli, Luciano Pavarotti, Aretha Franklin, Dave Brubeck, Burt Bacharach, and many many more. Mike has played lead horn with the traveling Broadway shows Lion King, Tommy and Wicked to name a few, as well as subbed with the Las Vegas “Lion King” show. He is an active movie and commercial recording artist with notable credits including “Mr. Jones” (1993), Jackson (2008), Arn 2 - The Knights Templar (2008). He played lead horn on the “Everquest” game and can be heard on the “Cinebrass Pro” project (2011), as well as the “Diablo 3” (2011) and “Bionic Commando Revived” (2007) game soundtracks. He has performed with many Orchestras including Billings MT. Symphony, Riverside Philharmonic, Mexico City Philharmonic, Orchestra de Baja California, Strauss Symphony of America as well as toured the West Coast as a soloist with the New England Youth Ensemble and played lead Horn in Carnegie Hall under John Rutter conducting his choral works. He has been an adjudicator for California’s All-Southern Honor Band and Orchestras Horn auditions. He enjoys teaching when not performing. One of his ventures in education was to record the “how to” horn videos for the band books “Tradition of Excellence” Book 1 and 2 by Kjos Music. Mike studied at the San Diego School for the Creative and Performing Arts, followed by San Diego State University and the Boston Conservatory of Music.